Tuesday 5th March - arriving at Circular Quay that morning I came across another giant cruiser - Radiance of the Seas. At Circular Quay station, I caught the next train to Redfern (1 station down from Central Station). The old inner city suburb of Redfern, with its lovely heritage terrace houses near the super modern University buildings is very popular with students. I was on the hunt for some murals, but it was hot and humid and after finding a couple of murals I got back on the train towards Petersham (4 stations further), known as the Portuguese quarter. In Petersham, the Sweet Belem Confectionery where I envisaged sitting down to eat a couple of custard tarts and buy corn bread (broa) was closed (Mondays and Tuesdays) 😞. I had to settle for a light lunch across the road in the Portuguese restaurant - Costa do Sol. At the Italian/Portuguese Convenience store on the main road, I bought Portuguese wine to take to dinner with our neighbours, and Quince paste (marmelada) for my son and daughter in law, who had requested it. Shopping done, I took the train into the city, and as the stops weren't being announced I didn't get out on the right one. Thanks to the "Opal" app (Sydney transport) I got off at the next stop and then had to take 2 buses home, following the route religiously on the app so I wouldn't get lost 😌. At 7pm, after Jose got home and tended to his little garden, we went upstairs to his Iranian neighbours who had invited us for lasagna. We took the Portuguese wine which they loved and for dessert we enjoyed a Chocolate mousse which I made earlier. 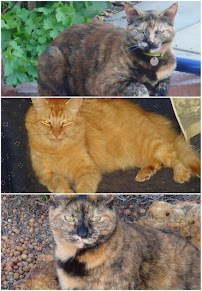 They have two Persian cats, an older very shy male - Tom and a young and playful female - Sophie. We had a great dinner, wonderful conversation and I'm so glad they keep an eye on Jose. Wednesday, 6th March - I would be leaving Sydney towards the end of the afternoon, so I met up with Jose at Central Station where his company has offices, to leave my suitcase so I could walk around unhindered. 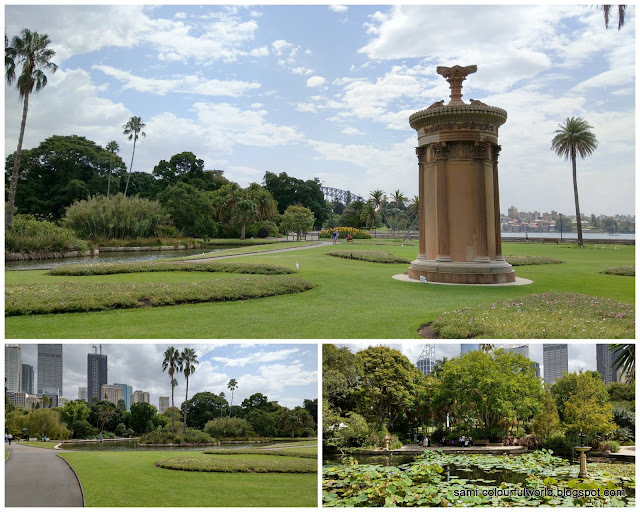 I wanted to visit the Royal Botanic Gardens for the "Plants that bite exhibition" at the Calyx. After the exhibition I wandered around the Botanic Gardens until I reached the Tropical Garden area, with it's exotic plants. The signs about the biting plants were informative. For other signs from around the world please follow this link. On the way out a few statues, and the pretty views over the city. I had to be back at Central Station just before 3pm, as Jose had a meeting at 3, so I left the park towards Circular Quay and suddenly the sky started to get quite dark and heavy as you can see on the next photos. As soon as I arrived at the main concourse the rain started pelting down! The Opera House, Sydney Bridge and the "Radiance of the Seas"
I called Jose when I arrived at the station, and he met me by the timetable board to hand me my luggage. We said our goodbyes and I walked to platform 23 from where the train to the Domestic and International airport departs about every 10 minutes, taking about 15 minutes. It had been a very hot (35C) and humid day in Sydney (we can have hotter days in Perth, but usually our summers are dry), so I was sweaty and clammy and as soon I arrived at the airport I went straight to the toilets for a change of clothes! I felt much better then, and I'm sure my travelling companions were happier around me too 😁. The flight departed about half an hour late, landed in Perth at about 7,30pm and I caught a taxi home where I arrived 20 minutes later. During the flight I watched two movies - the brilliant romantic musical "A star is born" which I'm sure would have been a much better experience in the big screen and "If Beale street could talk", a romantic drama which I found a bit sad. Have you seen any of these, and did you enjoy them? And for me it's back to my normal routine at home and work. ...wow, where do I start, there are so many neat things to see and do. Thanks for sharing. Sydney, thanks to your series of posts, is really coming to the top of my list of cities I want to see. I was there for a few days quite long ago, but never saw enough of it. Oh, I love those terraces! Back in 1995 we moved to Glebe in Sydney for a day and the area was beautiful, too. :-) "... who had requested it..." reminds me of how people from East Germany didn´t want just coffee but Jacob´s Krönung from us Wessies. It was a serious request as they used it as "West-money". "Opal" in Sydney - unexpected name to me. Awww, lasagna!!! You are really lucky with those neighbours! The art in the gardens is beautiful and the traps sure made me grin. The short goodbyes not so much! But I do wish more travellers would be like you and change after such a day! Very lucky with Jose's neighbours indeed, very nice people. How amazing! Would be a bit frightened by the plants, though! O Palácio de Queluz merece uma visita sem dúvida. Quem sabe numa próxima visita combinamos? Sydney is about 5 times bigger than Perth, so distances are huge. Luckily I don't mind walking and I also use trains or buses if needed. 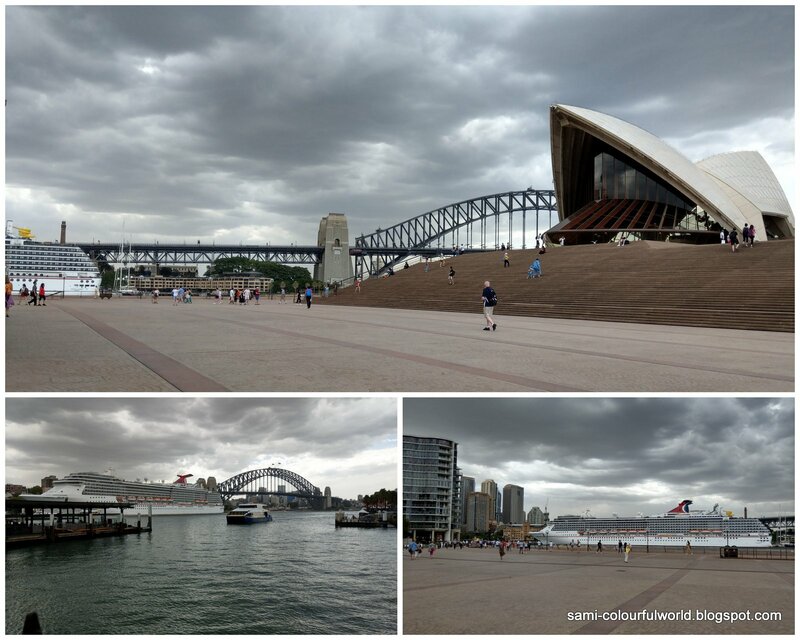 Lots of things to see in Sydney! Almocei ali ao lado da Opera House no dia em que cheguei. Um belo passeio por uma cidade fantástica minha amiga. That wad quite a commute back from Sydney for celebrating your Birthday together and for doing some further exploration. Fun signs of those flesh eating plants, although not threatening to humans... it was with quite some humor. Hoping that you both find a solution for managing life either apart or maybe moving together in one city. Thanks Mariette. I would prefer not to move to Sydney, and Jose is busy applying for jobs in Perth, so he can come back home. Even though I like Sydney for tourist purposes, it is too big a city for me, a lot more stressful and property prices are through the roof! Sydney looks like a nice place to explore. Your photos show off the city well. Have a wonderful day, Sami. Thank you Bill, yes a nice city. Beautiful photos of Sydney. I loved the Botanical Gardens. Those eating plants were intriguing and the signs were out of this world. You did a great deal on this last day there. You sure know how to pack a lot into a single day, even a half day! Thanks Elizabeth :) The bug eating plants are very interesting, apparently Western Australia has 1/4 of the world's varieties of those plants. Super collection of photographs - so much to see and do in Sydney. Yes, lots to do Jan.